Helping Vancouver Families 2017 — . On December 6th, the Lower Mainland Christmas Bureau opened its doors on another holiday season, welcoming families in need from across Vancouver to register to receive toys and clothes for their children. It was a busy lead-up to our opening day, with truckloads of donated toys arriving daily to our warehouse, and large shipments going out to the Christmas Bureaus in other municipalities across Metro Vancouver. New and returning registration and toy store staff worked like elves to help set up the registration office and toy store. This year's awesome Toy Store and Registration Team. The LMCB depends not only on generous donations of toys and clothing to fulfill our mandate, we also rely on dozens of individual and corporate volunteers each year to support our toy drives, help in our warehouse, and serve clients in the toy store. 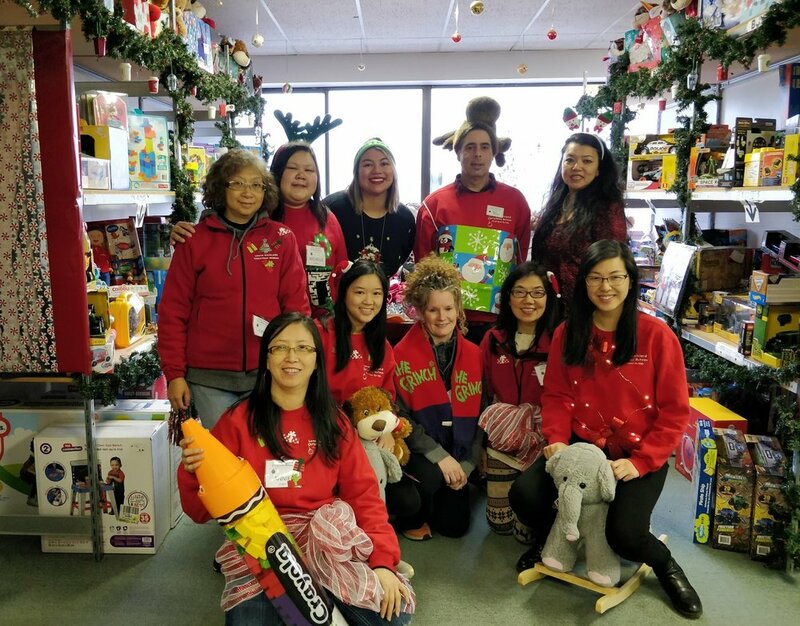 For many years now, Rogers Communications has sent a group of volunteers the day before we open to decorate our toy store with wrapping paper, stuffed animals, ornaments and other items to help make the experience fun and festive. Our 87th year registering families began with frost on the ground and a cool fog in the air. Both new and returning staff and volunteers worked hard to accommodate the many parents and caregivers who arrived early and lined up outside to register. While opening day had its usual (and unusual) bumps along the way, everyone pulled together and stayed in good spirits, and we ended up having one of our busiest opening days on record. In total, we helped 976 families with children living in Vancouver, giving 2,082 children and 1,348 caregivers gifts and toys, clothes and stocking stuffers, and grocery store gift cards for a Christmas meal. It was a hectic but incredibly rewarding holiday season at the LMCB. Thank you to our many warehouse and Toy Store volunteers, Paladin Security Vancouver for providing our Toy Store with a security guard, and Paragon Communications for loaning us radios to keep our team communication strong during the registration season. Last but not least, a heartfelt thank you to our seasonal staff. We had such an amazing team, all of whom assisted our clients with kindness, enthusiasm and compassion. We are excited about 2018 and we wish everyone the very best this year ahead.